The kingdom of Bhutan is a Buddhist country, its constitution declaring that “Buddhism is the spiritual heritage of Bhutan, which promotes the principles and values of peace, non-violence, compassion and tolerance.” But despite this declaration of adherence to the Dharma, the Bhutan government has begun implementing plans to develop 11 mega-meat processing projects throughout the country. These projects include fishery ponds, slaughterhouses, piggeries, poultry farms and more. The purpose of these projects is to make the country self-sufficient in meat and help keep Bhutan currency within the country. These projects are so contrary to the fundamental Buddhist ideal of not killing that shortly after these plans were announced, the Zhung Dratshang (central monastic body) of Bhutan submitted a petition to the prime minister requesting that these projects be halted. The petition emphasized the Buddhist teaching of not killing and pointed out how the planned slaughter of animals directly violated this fundamental principle and would cause tremendous suffering. Unfortunately, the petition failed to achieve its objective, and the projects started moving forward. Despite the lack of success so far, DVA is hoping that a continuing effort will lead the king and the Bhutan government to reconsider their decision. We ask that you join us by signing the petition at the bottom of this page, encouraging the leaders of Bhutan to abide by their constitution and act with the compassion and wisdom of the Buddha. 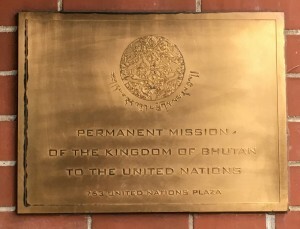 We have been trying to present our petition on behalf of thousands of people around the world to the Bhutan Ambassador to the United Nations in New York City, but the Bhutan government is not making it easy. In spite of countless eyewitness accounts, the government denies that it is building slaughterhouses. It has refused to meet with DVA representatives to receive the petition. On October 27, 2016, Emma Cobb, DVA’s New York City Co-Chapter Leader, delivered the petition to the Bhutan Ambassador’s office, but was not allowed to talk with anyone. As the only Buddhist Animal Advocacy organization in the world, DVA remains fully committed to bringing this to the attention of the world Buddhist community. 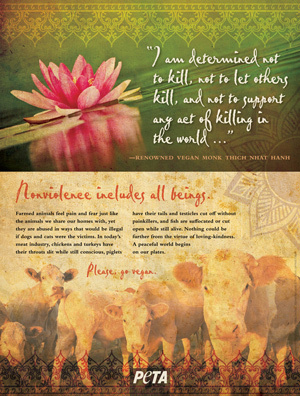 Dharma Voices for Animals is a non-profit organization based in the United States of America whose mission is to increase awareness of the suffering of animals within the Buddhist Dharma community. Among our worldwide membership are many well-known Dharma teachers: Tibetan monk Geshe Thupten Phelgye, who served ten years in the Tibetan Parliament in Exile and considers his Holiness the Dalai Lama as his teacher; Kamala Lama, the wife of the late Chatral Rinpoche (who was himself a member of Dharma Voices for Animals); England’s Ven. Gelong Ngedon Drime; the Venerable Thich Phuoc Tan, Vice President of the World Fellowship of Buddhists; and the Venerable Tashi Nyima, the former Executive Director for Health, Policy, and Planning, Latin American Institute, in the United States. This petition addresses the recent initiative by the Bhutan government to establish mega-meat processing projects in the country. We understand that the goal of the meat processing projects is to lessen imports of meat from outside Bhutan and to develop Bhutan’s economy and trade exports. We believe, however, that if you look deeply at these mega-meat processing projects, you will see that they will bring harm to Bhutan. The negative karmic consequences inherent in the business of animal agriculture are profound. The misery and suffering inflicted on the animals is unfathomable, and these projects clearly violate the First Precept of not killing, which includes animals as well as humans. The suffering caused by animal agriculture is the reason that the Buddha listed trading in animals as one of five occupations that are not Right Livelihood. These projects may also have the consequence of encouraging the eating of animal flesh, thus creating more negative karma and suffering. In addition, the proposed mega-meat processing projects will harm the environment, both globally and also locally in Bhutan. It is scientifically established that animal agriculture is one of the largest emitters of greenhouse gasses and contributors to global warming. Globally, animal agriculture is responsible for 18% of all global greenhouse gas emissions—and this is a conservative number. Even without fossil fuels, we will exceed our 565 Gigatonne CO2 limit by 2030, all from animal agriculture, and emissions from animal agriculture are estimated to increase by 80% by 2050! Furthermore, animal agriculture uses a significant amount of water, 20-33% of all fresh water consumption in the world today. Livestock and crops for livestock feed use 1/3 of all ice-free land on this planet. Animal agriculture is also the leading cause of species extinction, ocean dead zones, water pollution, and habitat destruction. It is also the leading cause of global deforestation. The projects exacerbate this problem. For example, we understand that forests have already been cleared for an 800 acre farm in the village of Samrang. If the mega-meat processing projects encourage the people of Bhutan to eat more meat, this will also cause the additional suffering that accompanies the diseases of the Western countries: heart disease, cancers and diabetes, to name but a few. These diseases are high in health care costs, which will become an additional expense to the government of Bhutan. We believe that if you look deeply, you will see that this project will bring more harm than good to Bhutan—especially to the people and to the environment. There are surely better ways to help the Bhutanese economy that will not create this profound negativity, animal suffering, human disease, and ecological destruction. We feel that the present course of promoting the mega-meat processing facilities is leading the Bhutanese people in the wrong direction. This is why the Zhung Dratshang also has submitted a petition requesting the government to stop the mega-meat processing projects. In considering the present petition, we ask you to please revisit the profound words of that august body. With this in mind, we the undersigned respectfully request that the Bhutan government immediately terminate its plans to establish the planned mega-meat processing projects. The international community looks to Bhutan as an example of what a society can look like when guided by Buddhist values and the Mahayana principles of working for the welfare of all sentient beings. The world has been inspired by the development of Gross National Happiness. As you reconsider this project and look for virtuous alternatives, know that our prayers and support will be with you. We appreciate your signing this petition and encourage you to take a very important additional step by becoming a member of DVA at no cost. DVA is very pleased to share some good news. In 2010, an important bill was introduced in Sri Lanka’s Parliament. The legislation, known as the Animal Welfare Bill, was the first of its kind since 1908 and included a number of urgently needed reforms that would have provided important safeguards for animals in the Buddhist nation. Unfortunately, at that time, the bill never advanced. In 2012, in order to revive this legislation, DVA posted a petition on its website that garnered over 2,000 signatures. In his October 2015 trip to Sri Lanka, DVA President Bob Isaacson made it a central theme of his visit. Now, thanks to this collective effort, the campaign has borne fruit. Sri Lankan President Maithripala Sirisena’s Cabinet has officially approved the Animal Rights/Welfare bill! After a few changes in the draft, it will be sent to Parliament for passage, and we are very hopeful that with President Sirisena’s approval the bill will now become law! The most important feature of the Bill is the establishment of the National Animal Welfare Authority which will function independently, working with its line Ministry. The bill will also spare countless laboratory animals by adopting strict guidelines for the use of animals in testing cosmetic and hygiene products and drugs. Congratulations and thanks in particular to Senaka Weeraratna, our Colombo, Sri Lanka, Chapter Leader, for his leadership both in drafting the bill and in advocating for it. Our deepest gratitude to President Sirisena and his Cabinet, all of you who signed our petition, and those of you who supported Bob’s trip to Sri Lanka. Over 2,000 people from around the world have signed this petition. Our petition is now complete. The Bill is being considered by the Sri Lankan government and we are awaiting the outcome. Sri Lanka holds a unique place in the world, with the longest continuous history of Buddhism of any nation. Buddhism has been the major religion in the island since its official introduction in the 3rd century BC by Arahant Mahinda, the son of the Emperor Ashoka of India, and over 70% of the population is Buddhist. The sangha (Order of Monks) has existed in a largely unbroken lineage since its introduction in the 3rd century, and Sri Lankan monks and lay people have played a prominent role in spreading Theravada Buddhism to Asia, the West and even Africa. Despite the urgency of the need for an Animal Welfare Law and its critical function of ensuring that Sri Lanka remains true to its Buddhist principles, thereby retaining its role as the pre-eminent Buddhist nation in the world, over two years have lapsed since the introduction of the Animal Welfare Bill in Parliament in October, 2010, with no sign of steps being taken toward its enactment. Dharma Voices for Animals (DVA) believes that this legislation falls squarely within our mission of addressing animal suffering within the Buddhist community, and to help in this cause we will be presenting a petition to the President of Sri Lanka, His Excellency Mr. Mahinda Rajapaksa, and to other Government officials urging them, on behalf of animals, to help make this law a reality. As supporters of DVA, we ask you to join in this effort by adding your name to this important petition. Dharma Voices for Animals is a non-profit organization based in the United States of America whose mission is to increase awareness of the suffering of animals within the Buddhist Dharma community. Among our worldwide membership are many well-known western Dharma teachers, Tibetan monk Geshe Thupten Phelgye, who served ten years in the Tibetan Parliament in Exile and considers his Holiness the Dalai Lama as his teacher, Lama Shri Sadhu Dharmavira, the Venerable Thich Phuoc Tan, Vice President of the World Fellowship of Buddhists, and the Venerable Tashi Nyima, the former Executive Director for Health, Policy, and Planning, Latin American Institute. Sri Lanka is the home of Theravada Buddhism, with a rich Buddhist civilization that began more than two millennia ago. The cultural heritage of Sri Lanka is a shining example of the power and influence of the Buddha’s teachings. In keeping with these teachings, Sri Lanka is also heir to a rich and unique history with respect to animal rights and welfare, with historical rock inscriptions and ancient chronicles, e.g. Mahawamsa, providing evidence of the extensive state protection that has been historically granted to animals. The ethic of Ahimsa (non-violence towards other sentient beings), a cardinal tenet in Buddhism as well as Hinduism, has been a paradigm of public administration and justice throughout the country’s history, with the social and legal history of Sri Lanka providing numerous examples of the Buddhist attitude of compassion towards animals. These include a series of royal decrees completely banning the killing of animals throughout their kingdoms, the establishment of animal hospitals as early as 341 AD, and a widely followed historical taboo against the eating of animals. In short, it is fair to say that Sri Lanka has been the model of a country that puts into practice the central tenet of the First Precept – non-harm to all animals. Despite this exemplary history, however, it has been over 100 years since Sri Lanka has enacted an animal rights and welfare law as a primary piece of legislation. The governing statute, the Prevention of Cruelty to Animals Ordinance, dates back to 1907, the British colonial period. This law is antiquated, and it completely fails to address the welfare of animals in modern society. Its limitations are particularly apparent when compared to animal welfare legislation of neighboring countries such as India and Bhutan or western countries such as England or Australia. For example, the maximum punishment it provides for the heinous crime of cruelty perpetrated on an animal in violation of its provisions is a fine of 100 Rupees – barely $1 U.S. The inadequacy of existing legislation to safeguard the welfare of animals is strikingly inconsistent with Sri Lanka’s role as the pre-eminent Buddhist nation in the world. Moreover, it neglects a core principle codified in Article 9 of the Constitution, which states that “it shall be the duty of the State to protect and foster the Buddha Sasana.” Without a fundamental revision of its laws, Sri Lanka risks abandoning the legacy of an animal-friendly cultural heritage that dates back almost to the time of the Buddha and neglecting its responsibility explicitly mandated by the Constitution. In an effort to rectify this situation and bring Sri Lanka’s laws regarding animals up to modern standards, in 2010 a Private Member’s Bill – based on the Animal Welfare Bill prepared by Sri Lanka’s Law Commission in 2006 – was presented to Parliament. Unfortunately, it has not been acted upon. Its passage in Parliament is critical for Sri Lanka to maintain its status as the leading Buddhist country in the world. The signers of this petition are people from all over the world who are proud of Sri Lanka’s role in safeguarding the Dharma and hopeful that Sri Lanka will continue this tradition in all its aspects, including the fundamental teaching of non-harm to animals. Accordingly, we urge His Excellency Mr. Mahinda Rajapaksa and other Government officials of Sri Lanka to enact the Animal Welfare Bill without any further delay. I WISH TO SUPPORT ANY WAY WE CAN BRING AN END TO FACTORY FARMS HERE IN THE uNITED sTATES…AND BRING TO AN END THE HORRIBLE TORTURE TO ANIMALS — COWS, PIGS, CHICKENS.. ALL FARM ANIMALS. Here in latter day century, that this practice goes on — and goes on legally — is barbaric. I just found your website in a Tricycle magazine….and having been involve for years in the rights of Animals, and very sad to read recently how Jack Kornfield loves hamburgers…it is refreshing to see this website and the names of many teachers who include the compassion for animals in their life style…. DVA is to visit my country -SriLanka, soon. Please urge all tourists and the Sri lankan President, to CLOSE DOWN the so called ZOO (Zoological Grdens)at Dehiwela ,Srilanka. Animals such as Leopards and Lions are caged in extremely cruel conditions here, and Elephants cruelly abused to “perform” dances.Instead, expand our Wildlife parks. https://dharmavoicesforanimals.org/blog/bob-isaacsons-trip-germany-england-sri-lanka/ I hope to return to Sri Lanka later this year and work with our Chapters in Colombo and Kandy to continue raising awareness of animal suffering. Hapiness for all. All needs hapiness so the animals. We should not kill animals. Nice to know that someone cares about animals. Be a vegetarian….everyone in this world needs peace. Do not kill and harm animals….animals are not our food, shelter, and clothing. Though the Government has started with the plan with good purpose it is never late to turn this plan into other feasibility economy activities as it will save millions of lives. I think Government will turn into this project into other meaningful projects and save millions of animals’ life as good causes. Please stop such deeds against sentient beings. They are our parents. Let’s make whole killing free zone. All animals are living creatures. Let’s learn to love them and save them too. We vegans love animals. So i say no to slaughter houses la..
Like human animals should also be given the right to live, so save animals and be vegetarian. Animals are slaughtered because people eat them. If all stop eating animals there will be no more killing. Do not start this project. Even if the project is bigger than mega project it’s not going to make Bhutan developed so much. Bhutan has enough and can survive through. It’s not necessary to have meat mega project to develop Bhutan. Please please stop this plan……. I really thank DVA for planning to terminate this hell situation and hope to fulfill the aim of public. I disagree with such project. Let’s not kill animals .. they are our parents. They also want happiness like us. Let’s save the innocent creatures…. Let’s save the innocent creatures. Lets stop eating meat and save animals. I had already signed this petition in early 2016 where at that time the numbers signed was around 1650 out of the required number of 2500.I have also shared and requested to sign. The petition is being presented to the Bhutan Ambassador to the United Nations. Updates will be added to the home page of our website. I am very much sadden to view and hear that such a mega project have been decided and started at samrang. Mega Project to kill numbers of animal. So, I would like to request every individual to be vegetarian. It is the first and simple way to convince the government so that the budget can be used in other useful projects in our country. As we know as the followers of the Lord Buddha, Dharma means truth, that which really is; it also means law-the law which exists i a man’s own heart and mind; it is the principle of righteousness; therefore the Buddha advises to man to be noble, pure and worthy of honour. The entire universe is an embodiment or revelation of the Dharma. To such extent that we value and love our own lives, animals also have the same right. There were instances that hundreds of cattle pay their ultimate sacrifice in the hands of cruel hands of butchers and even their meat is sumptuous diet for many. But it is fortunate to see that the trend is gradually minimized due to the true and genuine efforts of passing the bill. I know that the majority becomes completely free from eating beef, mutton or chicken. In Sunday Schools (Dhamma Schools) most of the children have sworn in not to eat meat throughout their life. Only humans cannot survive in this world putting other innocent animals in danger for satisfying their comforts. I wish that with the passing of this new piece of legislation, time will come to see the country free of meat consumption. The world was not made for human beings alone, nor is the world always made out in their favour. Let me conclude with this saying of Mahatma Gandhi of India – “The greatness of a nation and its moral progress can be judged by the way its animals are treated” – May all living beings be well and happy !